Following from an amazing food weekend in Paris over the summer and more recently Fontainebleau, we had been craving some great authentic French fare. While French food has never been our favorite cuisine (probably not even top five), its hard to not appreciate the traditional favorites slathered in butter. One such location to get some of the best, in a fantastic venue, at very reasonable prices, is Brasserie Zedel. Zedel is located right in Picadilly Circus in the basement of the old Regent Hotel. The venue is enormous, decorated in Art Deco style transporting you back to the 1920s as soon as you enter the door. On the main level there is a cafe/bar where you can have some small plates and a coffee, but the real journey begins when you walk downstairs and enter a grand foyer with entrances to either a comedy/music venue, a Bar (Bar Americain), or the restaurant itself. Bar Americain is set up in 1920's Art Deco style as well, serving up lots of classic cocktails at a slightly elevated price given the restaurant next door (roughly £9.75 to £11 a pop). While I've been to the bar on a few occasions, it isn't the star here. Walking into the Restaurant itself, Brasserie Zedel, is like stepping back in time. The venue is enormous with 30 foot ceilings and sitting between 200 and 300 people in one grand dining room. When seated at the table you are provided with a very classic French menu with a great deal of choice usually not available at such a grand restaurant. Similar places usual only give you 5-8 choices for apps and mains in al la carte menus, but at Brasserie Zedel there are no less than 20 appetizers to choose from and roughly 15 main courses. More than enough to keep you coming back time and time again (hence why I have been twice in recent memory). During my experiences at Zedel I've tried a number of different dishes, but just a few important ones to note. The most memorable of these was Choucroute de la mer, which was a hot plate of sauerkraut and different seafood. While this may not actually sound very good, it was unbelievable. It had rich and complex flavors, not overwhelming as sauerkraut can be when eating it with German food. There were bits of salmon, prawns, mussels, and some types of white fish, but all was cooked perfectly. 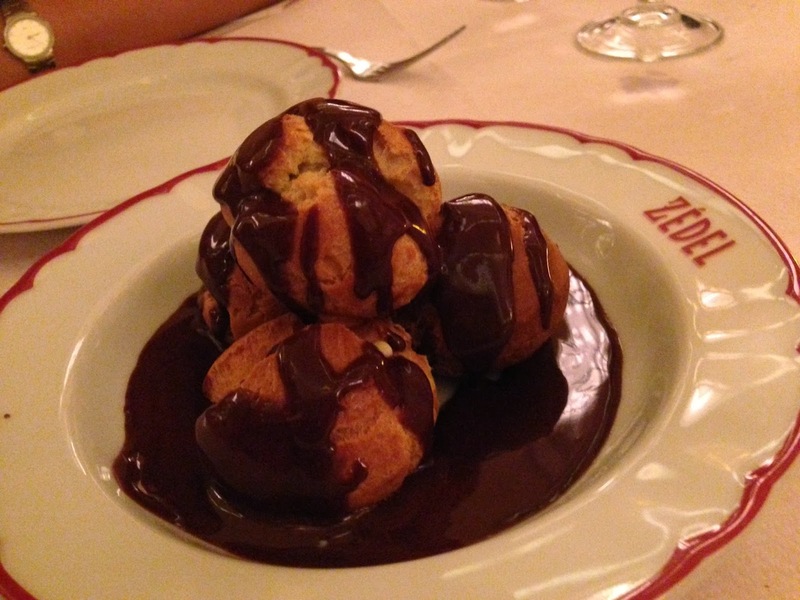 Other great dishes include escargot in a garlic butter sauce, duck liver pate, and profiteroles, all of which would stand up in Paris. A meal here will likely only set you back about £30 for two including a glass of wine, however the wine list is reasonable and has a number of bottles below £25 if you choose to go that route.